What seeds you plant today will change your tomorrow. Choose the path that lets you be you. Whereas ZEN is of the moment and what is, SZEN celebrates what could be. SZEN ZONE – Reaching a State of Positive Change contains lighthearted and positive narrative on life and its possibilities, with stories that cover the gamut from interesting to profound. The general overarching theme is on change and all of the aspects of it – Creating, surviving, and managing change with the goal to recognize the power we have to become what we choose, both when we’re feeling in control and how to mange when we’re not in control. 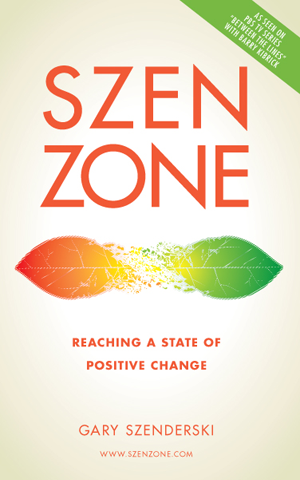 The SZEN ZONE focuses on identifying the lift-off point for creating positive change. Although everyone is different and it’s a very individual and sometimes internalized process, the principles in this book can help you establish the context and right frame of mind to embrace and manage change. After many years of professionally helping individuals and companies navigate change, I’ve observed how some changes seem to take forever while unforeseen change can come right at you and in an instant move your world. 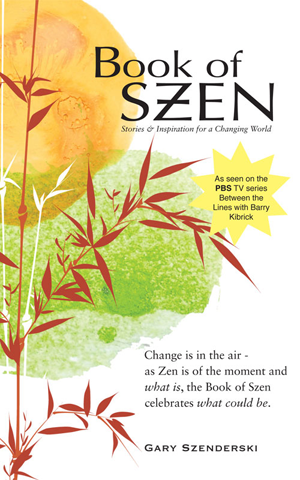 The Book of Szen is a compilation of stand-alone stories and observations that celebrate the power in each of us to create positive change in our lives, to be what we want to be. Whereas Zen speaks of the moment and what is, the Book of Szen reflects on what could be. Essentially, it is not a “how-to” book, but a “why not” book. It’s a down-to-earth collection that includes simple anecdotes and short stories that encourage us to reach our sometimes forgotten voice, a voice that yearns for a better life. You’ll find that the Book of Szen is sensitive to life and is as easy to relate to, as it is to read. The most common feedback I’ve received from readers over the years is that they felt that the Book was speaking to them directly about exactly what they needed to hear at the time. I love how you write. A Szen story each night put me to sleep with a positive thought and smile on my face. Amen to that! It’s all about the choices we make when defeat happens. You can either choose to grow from it or not. Good life lessons. Thanks for bringing it to the forefront – A very important message. Gary, Your writing is beautiful! You are an amazing man and deserve the best outcome. Wonderful…Thank you from one of your fans on a job well done! When I pick up your book I seem to find just the right story to touch my heart, move me forward and give me courage. It’s like having a best friend close at hand. Judi Avon. Port ElginOntario. Canada. Gary, You really have just made my day. Thanks for sharing…..
Gary’s writings reveal a serial optimist – humanistic prose, an understanding of our species, and an abiding faith that we CAN achieve a positive outcome. Why read Gary’s stuff in the first place, would you complain if your life got better? Always a treat a comfort and a pleasure to read and reflect on your words. Thank you for being a bright, shiny light in the dark. Your words fell on a good place today. You are a positive force in many people’s lives. Keep going. How beautiful. You touch so many. You are too darn funny!! I adore your writings. Congratulations on your epic book!! . . . it is very enlightening!